12 V 7 Ah VRSLA Battery for Dyacon weather station controllers and similar solar powered equipment. 12 V 7.2 Amp-hour Battery for Dyacon weather station CM-1 controllers used in MS-130, -140, and -150 weather stations. Daily solar charging and discharge will reduce the capacity of valve-regulated sealed lead-acid batteries. Dyacon recommends replacing the battery every three years to maintain the autonomous operating duration of your weather station. 0.25″ spade terminals provide a reliable connection to quick-connect wire receptacles. Not all 12 V 7 Ah batteries are created equal. Many do not hold up well to daily temperature cycles experienced meteorological equipment. 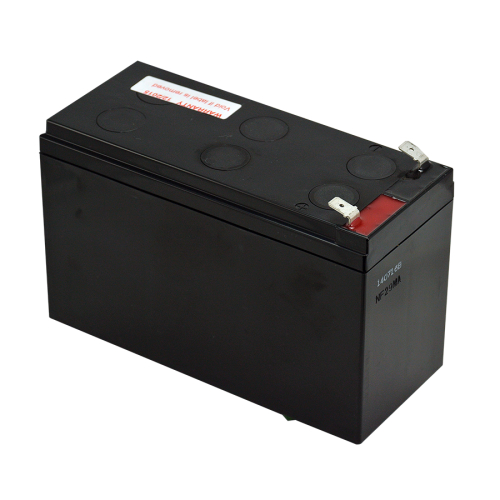 Batteries sold by Dyacon have significant field experience and a proven track record. Why sealed lead-acid batteries? While some may say that “modern” technology has moved beyond lead-acid batteries, that is not the case. Valve-regulated sealed lead-acid (VRSLA) battery technology is exceptionally robust to the challenges (abuse) inherent in solar-powered environmental monitoring equipment. Lithium-ion and other battery technologies must have tightly controlled charge conditions, VRSLAs can safely charge slowly or quickly in hot and very cold conditions. They also operate reliably at low temperatures. VRSLAs are a cost-effective solution for stationary equipment.